The weather continues blisteringly hot and the heat index has been hitting record highs of late – devastatingly record highs, if I may add, alas. 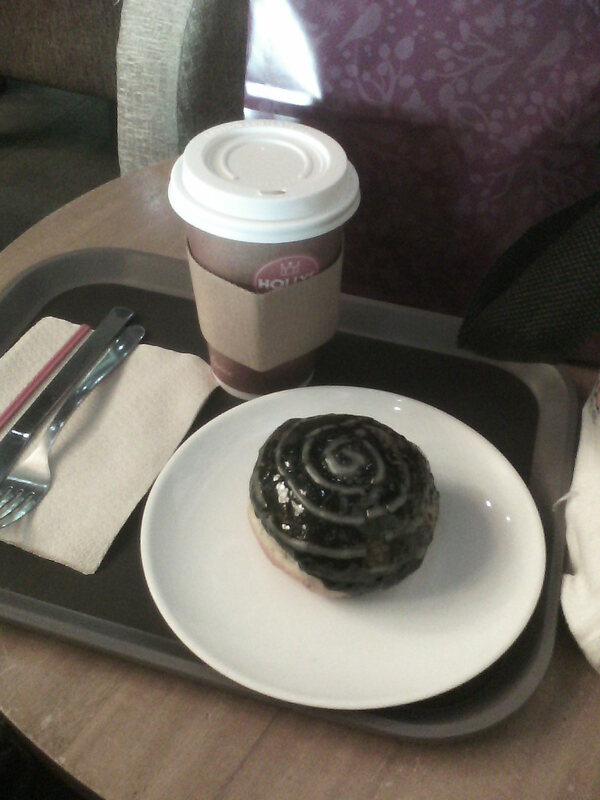 It’s times like these when I wish that Cebu would send over one of their best refreshment chains up north to us in Manila. Seriously, I’d do anything to have a Tubo Cane Juice kiosk somewhere within walking distance right now! As its name suggests, TCJ’s stock in trade is sugarcane juice (Tag. : katas ng tubo). Sugarcane stalks are run through a mechanized press that crushes the sweet juice out of the hard, fibrous sticks. This liquid is a pale amber in color, surprisingly mild with regard to its sweetness considering what is produced when it gets reduced by heat into the familiar crystalline granules we use for cooking, baking, and sweetening our morning cup of caffeine. Each cup is pressed to order, thus ensuring the pristine quality of the end product. Poured over crushed ice as is, sugarcane juice is a delicious, revivifying drink with which to cool down. But TCJ isn’t content with slaking the southern crowd’s thirst with plain sugarcane juice; oh, no, sir! To add value in terms of both taste and nutritional value, TCJ blends freshly-pressed cane juice with equally-fresh, equally just-squeezed juices to create a delicious line of refreshments. While I could have opted for a right-in-season mango infusion or sipped a superfood mix featuring milky-white and tangy guyabano (soursop), I needed something to soothe a throat that was threatening to ache along with a serious dose of Vitamin C. For that, I had to order the Ginger-Mansi. Here, fresh root ginger is run through the same crush-and-extract procedure as the sugarcane. The resulting ginger presse is sharply aromatic, hinting at just how potent and pungent it will be if sampled straight. This is mixed with fresh cane juice and a good squeeze of fresh kalamansi lime, poured over ice (a large will set you back P 90.00 – not a bad deal as Manila juice bars tend to be a bit more expensive), and handed to you with a typically cheerful Cebuano smile by the staff at the counter. To describe it is to say that it is, pretty much, a still [non-carbonated] version of ginger ale: bright and spicy, just fiery enough to wake up your tastebuds, just sweet enough to stave off the burn. The citrus tang of the lime cuts through and each sip is a soothing, harmonious blend. Now, there are sugarcane juice kiosks here in Manila. However, these are few, tend to be far between, and rarely feature other flavors. Which begs this question from me: when does Manila get a TCJ franchise…or do I have to take another trip to the Queen City of the South for a sugarcane and ginger fix? Practically everyone here in my neck of the woods has been coughing or sneezing of late. The weather is strange: blisteringly hot at noon, bone-chillingly cold at night. Pollution is at an all-time high, especially on traffic-strapped streets in the big city. Throw in long hours languishing in the said traffic in a bus packed like sardines with people of varying states of health, and it’s a recipe for disaster. Keeping this state of things in mind, there is a need to amp up the Vitamin C in one’s system to scare off any bacteria or viruses nasty enough to try and take up residence in one’s body. Oranges, in particular, are plentiful at the moment and are one of the most delicious ways by which to give your immunity a boost. From domestically-grown green dalandans and their bigger cousins the sintunes to sweetly juicy ponkan mandarins and clementines to the hard-to-peel but honeyed Valencias, they are quite a healthy treat. Ginger is another good, natural restorative and preventive. Typically prescribed for sore throats, ginger also works wonders for upset stomachs and jumpy nerves. Likewise, throw in a superfood like acai berries into the mix and you have something that can certainly keep even the most virulent infections at bay. One tip, though: don’t use standard commercial ginger ale in this. A pure infusion of ginger or, as in this case, a ginger, lemon, and honey blend can give you more of the health-giving benefits. Most commercial ginger sodas are, alas, nigh on useless as they are mostly 60 – 70% sugar than actual ginger extract. In a large mug, pour in the water and muddle the lemon slice to release the juice. Mix in the acai concentrate and the mandarin juice; stir till well-combined. Add 3 – 4 ice cubes and top up with the ginger infusion. Mix well; serve immediately. Anyone up for chocolate milk? “We need to get our grubby little paws on that stuff,” I declared to another chocoholic friend. Well, there you go. But, hey: all good things come to those who wait. Sure enough, even if the folks at Whittaker’s still haven’t caught on to the massive craving for chocolate milk in this part of the world, someone else managed to beat them to the punch: Cocio. 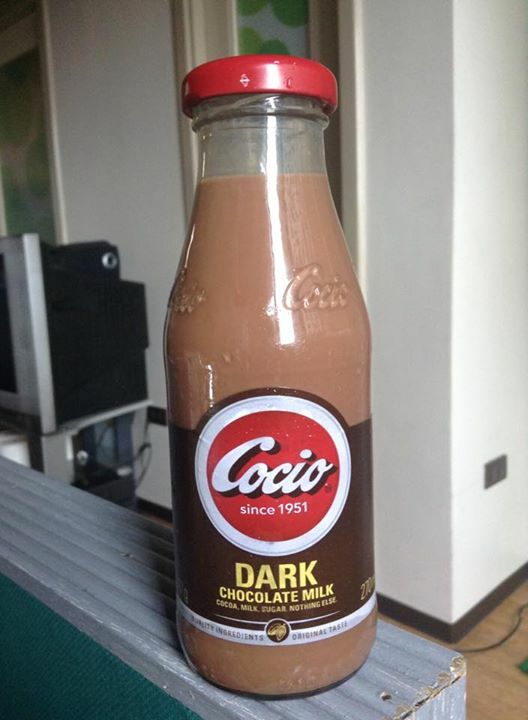 Cocio is a Danish dairy brand that does chocolate milk in two ways: classic and dark. A company that believes in the purity and quality of their ingredients, they make it a point to state rather succinctly that all you get in the bottle is cocoa, milk, and sugar – and believe me when I say that is is never as sweet as the more popular commercial brands here in the Philippines. There are big events to handle at the office, gifts to buy and gifts to bake, people to coordinate with, meet-ups to schedule or cancel depending on the situation. The last few days before the Holidays are a mad, mad time – especially for those of us in the advertising industry. There are numerous events to handle for clients: end-of-year sales runs/mini-concerts, ads to place before the country shuts down for two weeks of Yuletide cheer, last-minute arrangements and contract renewals. Believe me when I say that it would be so very easy to buckle under the pressure and burn out. Thank goodness, therefore, for both coffee and tea breaks. Sometimes, all you need is a wee cuppa tea or joe to stiffen up your spine for just a little longer; other times, only something massive, iced, and calorific will do. 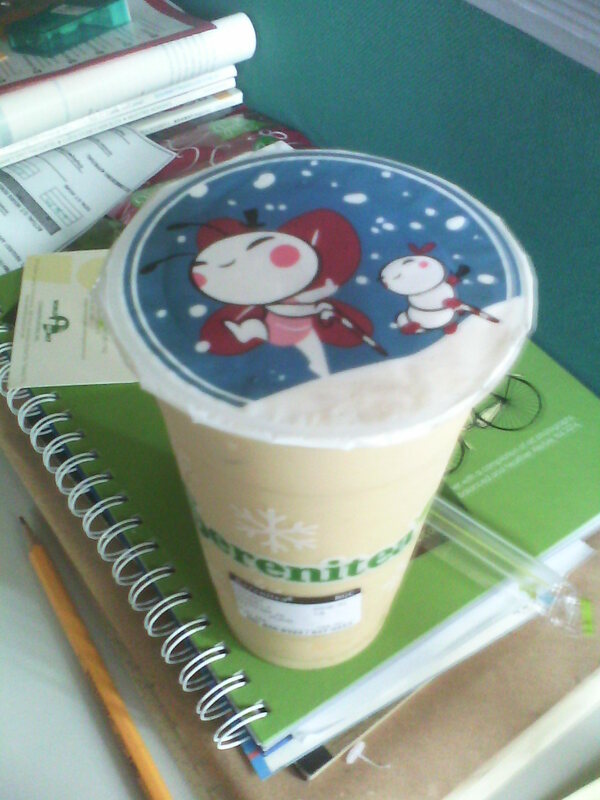 For that, Serenitea is a good stand-by. The mango jasmine milk tea with its rather floral flavour is one such sipper. The blossomy notes of the jasmine black tea are played up beautifully by the addition of lightly sweetened mango compote. Add generous dollops of custard pudding and you, dear reader, are all set for a slurp-filled break. If you’re hankering for something more substantial with a slightly savoury edge, Hollys Coffee offers its sea-salt mocha. You get a distinctively chocolatey drink made with good espresso and a shot of Belgian chocolate ganache: creamy-rich, duskily bittersweet, and so moreish. The sprinkle of sea salt makes the flavours of both chocolate and coffee pop. Order it hot to enjoy the full benefit of its invigorating smoothness. As I am writing today’s post, Typhoon Ruby (International Code Name: Hagupit) is raging throughout the Visayas and even we in Manila have not been spared. Public storm signal #1 was raised over the National Capital Region last night at 11 PM – and stronger signals remain hoisted over much of the Central Philippines, including the provinces of Samar and Leyte, both of which were ravaged by the devastating Typhoon Yolanda/Haiyan last year. The best course of action is to stay indoors at this point in time and keep one’s self posted with regard to news updates on the radio or on television (if, of course, the power holds out). Hot chocolate, in my personal opinion, is one of the best ways by which bad news can be made a little easier to deal with. If you’ve the time to spare or if you’re calmer than most people, you’d make it from scratch: whisking together milk, dark chocolate, and spices over medium heat till that subtle alchemy transforms those ingredients into a soothing drink. But, if you’re too wired to do any work in the kitchen at the risk of burning yourself – or your house! – then instant mixes are fine. 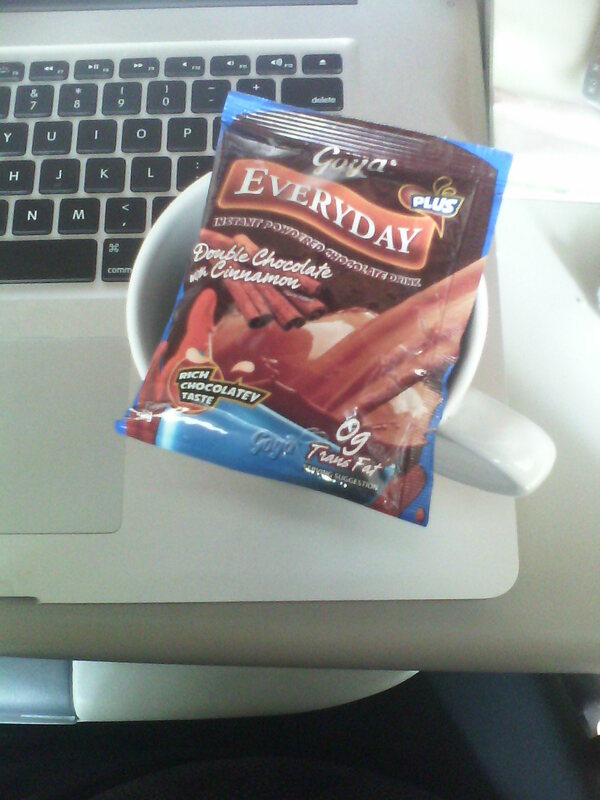 Goya, that old local stalwart, has the Everyday brand of hot chocolate mixes. There’s plain hot chocolate, chocolate with marshmallows, and the double chocolate with cinnamon. If this doesn’t hit the spot, nothing will. It’s surprisingly rich for an instant mix: dark, smoky, a slightly bitter edge softened somewhat by the nip of cinnamon added to it. Cold weather comfort, indeed. In the meantime, we huddle before our televisions or tablets, radios or laptops, and pray that the storm gives up and finally lets our people go. Yes, I know it looks rather like marmalade – specifically one made with bitter-tart Seville oranges – but here’s the kicker: this stuff is actually a fruit tea! It’s a mad notion, I know, but this 600-gram jam jar contains enough citron tea to stave off colds and soothe sore throats for the coming cold season. This is yuja-cha. 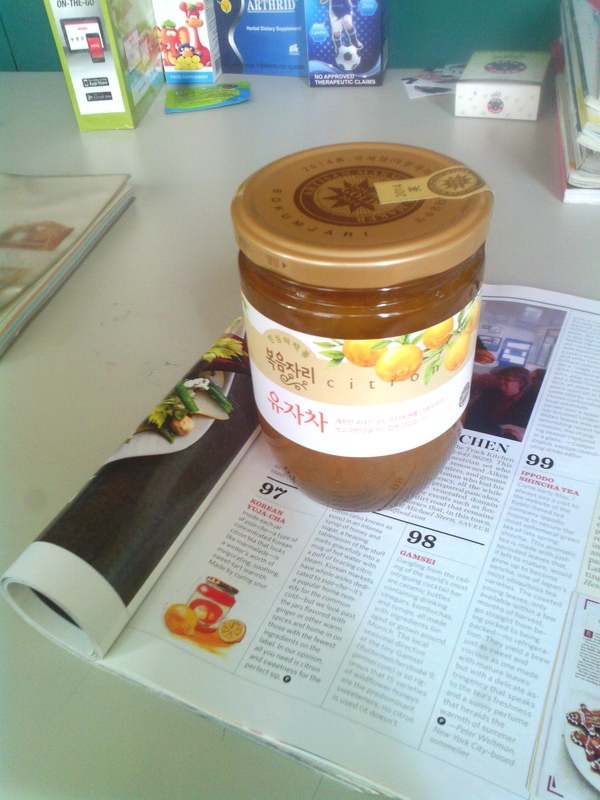 It is, for all intents and purposes, a type of Korean marmalade specifically created not for slathering on bread or scones but more for dissolving in hot water to make a warming, soothing, rejuvenating drink in chilly weather. It is part of a long Oriental tradition of steeping preserved fruit, flowers, and herbs in hot water to make beverages that are both refreshing and healthful. To be quite specific about it, yuja-cha is the name given to the prepared drink. The marmalade itself is referred to as yujacheong or yuzu (citron) paste. Yujacheong is prepared by first washing bright yellow (ripe or slightly underripe) citrons in salt water, then drying them up. The dried citrons are, then, finely sliced and marinated in dark honey or a heavy sugar syrup for a few days until the paste is ready to use. 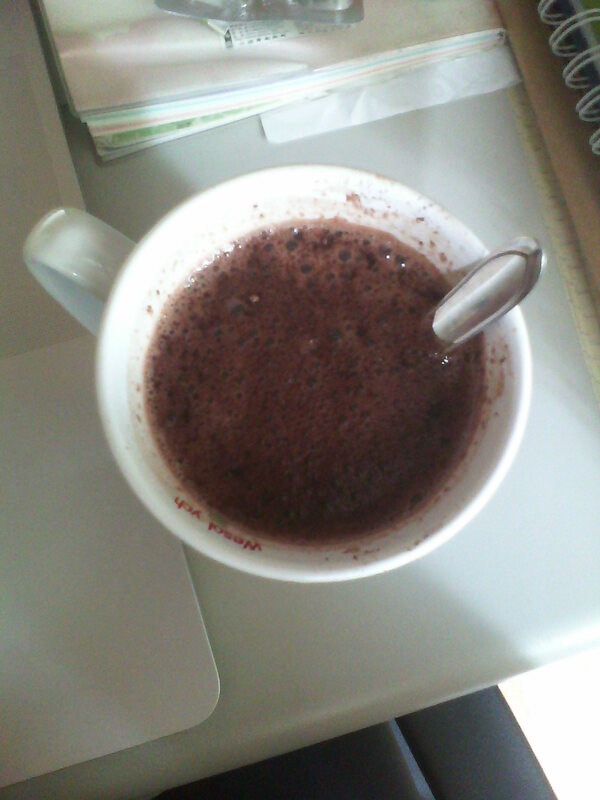 One takes a heaping tablespoon of yujacheong and dissolves it in a mug of hot water. The fragrant steam helps to clear congested sinuses, the honey calms down ragingly sore throats, and the tangy citron provides plenty of vitamin C to stave off nasty viruses. Saveur Magazine featured yujacha in its 2014 Saveur 100 list of the best things to eat, drink, and read, citing it for its lovely citrus taste and warming qualities. Interestingly, it also works well when prepared like lemonade: a tablespoon dissolved in a tablespoon of hot water and topped up with chilled water – still or sparkling – over ice works wonders on hot days. If you’re lucky enough to grab a jar of yujacheong (and if you live or work in the Bonifacio Global City, the many Oriental groceries keep it in stock for P 280.00 per 600-gram jar), you might also try my spin on the classic Dark and Stormy cocktail as a refreshing sipper with plenty of sassy, bittersweet, tart bite. Dissolve the yujacheong in hot water; allow to steep for a few minutes. Add the rum and pour over ice in a tall glass; top up with the ginger ale. Muddle with a swizzle stick; serve immediately.